Stuttgart, May 2013 – Coperion GmbH, Stuttgart, Germany, has equipped a special assembly facility for its modular compounding systems at its production site in Shanghai/China. This new 2,000 m² facility will help to cope with the increasing demand for modular compounding systems in the rapidly developing markets of the Far East. 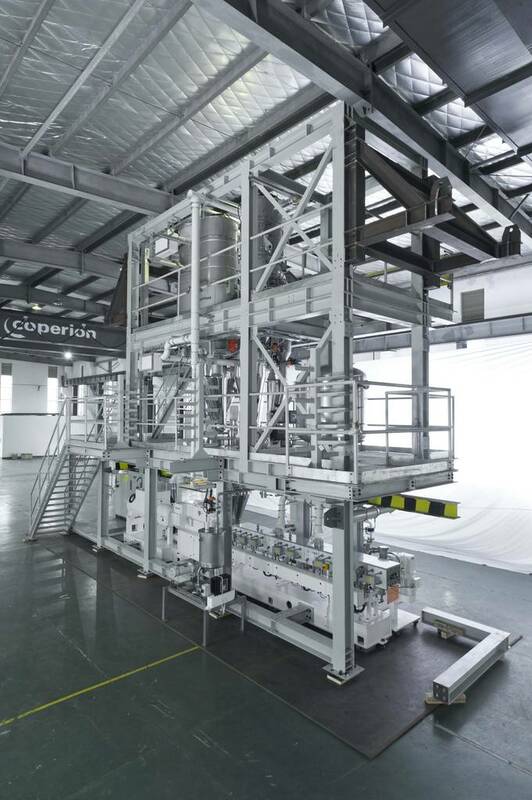 As is already the case in Europe and America, Coperion can now design and build any compounding line – conventional or modular – close to the customer. Moreover, every modular compounding system built by Coperion is to a certain extent unique, as it is configured exactly to the customer’s specific requirements for the product to be compounded. The assembled compounding system is ready for production and trials can therefore be carried out with the actual product. This new assembly facility in Shanghai will also support local value chain activities, as a large proportion of components will be sourced locally. The Shanghai production site was built 16 years ago as part of Coperion’s strategy of global presence and has been continually enlarged and improved ever since. In the face of strong competition, Coperion secured the Swedish Hexpol Group’s first order for the building of a modular plant in Shanghai in January 2012. The compounding system was destined for the Group’s member company Hexpol Compounding Co. Ltd., Foshan/China, where it is now being used for the compounding of thermoplastic elastomers (TPE). After assembly and commissioning at Coperion’s facility in Shanghai, the system was delivered to the customer, installed and put into service on a very short timeline. The core equipment of the modular compounding system is a twin screw extruder (ZSK) with 82 mm diameter screws capable of a maximum output of 1,800 kg/hour and suitable for different TPE formulations without any need for conversion. One of the most important user benefits of Coperion’s modular concept is the standard floor-level installation of the ZSK 82 Mc18, permitting ready access during normal operation – especially for cleaning when changing over from one product to another – and also for maintenance and repair. The handling systems for the raw and finished products were also designed and supplied by Coperion in Shanghai. K-Tron gravimetric feeding systems are integrated into the modular compounding system. Coperion and K-Tron are both operating companies in Hillenbrand’s Process Equipment Group.Around the middle of 2012, Hexpol supplemented the production line by a laboratory compounder with a Standard Twin Screw STS 35 advanced extruder from Coperion Nanjing/China. This laboratory compounder is used primarily for the development of formulations and for customer trials. It is also suitable for the production of relatively large sample batches. The decision in favour of a Coperion compounding system is explained by Carsten Rüter, President Technology, Hexpol Compounding, as follows: “We were most impressed both by the thoroughness with which Coperion’s experts dealt with our production requirements and by the exactness with which they accommodated our wishes and needs. Within an extraordinarily short period of time we received a high-performance production line in which the conveying and compounding systems came from one and the same manufacturer. We are using the modular plant for the production of high-quality TPE compounds that satisfy all requirements, both our own and those of our customers. These products are also internationally competitive and therefore enable us to expand our presence in China to a decisive extent.”Andreas Müssle, Managing Directior of Coperion Machinery & Systems (Shanghai) Co. Ltd., describes the importance of the modular assembly facility for the local market: “In the 4th quarter of 2011 we decided to build upon our existing expertise in sales and engineering and make a strategic investment in the local assembly of our modular systems.